Since Comic-Con officially starts today, I thought that I'd do a throwback that features some of my favorite cartoons. And not just those from childhood, either. I totally watched cartoons through high school, haha.Sure, I still catch them on Netflix every now and then, but I haven't regularly followed any (not counting The Simpsons and South Park, since they're not geared toward children anyway) regularly in years. 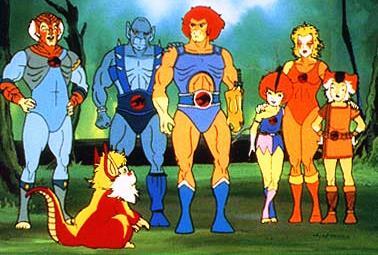 Now, my very favorite from elementary school: ThunderCats. You better believe that I was the only girl in the first grade rocking a ThunderCats lunchbox and thermos! I loved that show, from how cute Snarf was to how cool it looked when Cheetara ran to the Rober-Berbles and how neat it was to have robot pandas around. Mumm-ra was a pretty scary bad guy, but I thought he was unique. 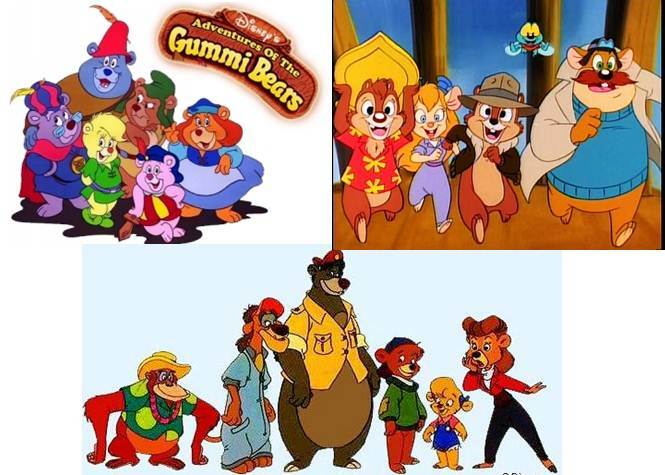 Next, the cartoons that I watched religiously after school as part of the Disney Afternoon years: Gummi Bears, TaleSpin, and Chip 'n Dale's Rescue Rangers. As I've probably mentioned before, Rescue Rangers was what we talked about at snack time in Kindergarten, so I had to be up the latest adventures of Chip, Dale, Monty, Gadget, and Zipper! FatCat was my favorite villain, though Nimnul ran a close second! 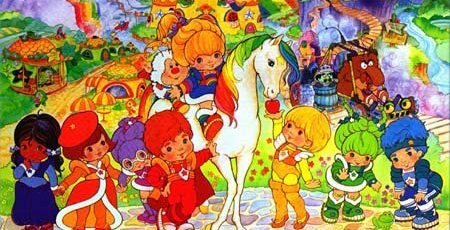 I thought that the storyline for Gummi Bears was just fabulous, and the characters were quite lovable. With TaleSpin, it was simply the characters. I thought that Don Carnage was a hilarious bad guy, and the idea of "cloud-kicking" blew my mind. The storylines were a bit outrageous (I wasn't the best at allowing myself to have a willing suspension of disbelief as a child) and wrapped themselves up all too quickly, but how could you not love Wildcat, Baloo, Molly, Kit, and the others? And, on the weekends as a youngin', Foofur and Punky Brewster were my Saturday Morning Cartoons of choice. As a kid who was deathly afraid of dogs, the idea that a bunch of canines lived together (along with Fencer the cat and a few rats) with no real owner was amusing. The constant hiding from the realtor was funny to me, and I just remember laughing at the show all the time. With Punky, I think it was Glomer who first sucked me in. He seemed like such a cool "pet" and I had a fascination with magical creatures and the world of fun that they could create for someone. Sure, Punky and her friends were cool, but Glomer, he was amazing! Middle school was pretty simple for me... Rugrats and Doug. I was new to having Nickelodeon, and those two shows were big hits with me and my siblings. While everything that the rugrats ever did was pretty unbelievable, I adored their ability to teach about other cultures and holidays, and thought that the writing was great. Doug was quite a bit more believable (well, not the fact that people were blue, haha), and I thought that most of the secondary characters were well-written and developed... like Judy, Connie, and Mr. Dink. I'll even admit that I actually liked the Disney episodes of The Brand-Spankin' New Doug, which wasn't a hit with a lot of other people. I thought that aging the kids a year did a lot for the show and the way they handled the situations that were faced. 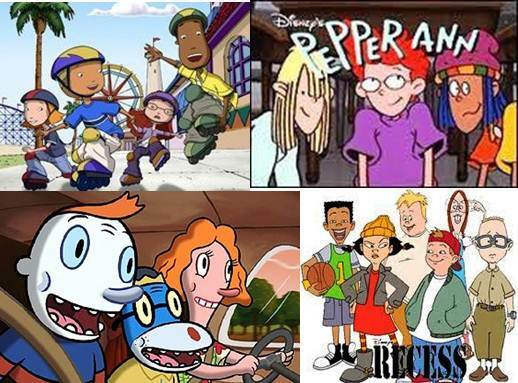 In high school my favorites included The Weekenders, Teacher's Pet, Recess, and Pepper Ann. The first two were Saturday morning shows, the latter two were afterschool shows (though they began on Saturdays, of course). I've written about a few of these before, but in a nutshell, it was the characters that kept me coming back. In The Weekenders, the cast was pretty small, so it was easy to latch on to each of the four, and understand where they were coming from and what they were doing. With Teacher's Pet, the idea that a dog went to school was pretty intriguing, but the fact that his teacher was also his owner (and she didn't realize who the dog was) baffled me to the point that I just couldn't stop watching, waiting for the day that she discovered the truth. My fourth grade wasn't like Recess in any way (we didn't even have cliques yet), but the storylines were incredibly believable to me, and the roles that the kids took in each scheme just made sense. Similarly, although I couldn't directly relate to Pepper Ann, I just "got" the show and her interactions with other characters was just moving for me. My college cartoon was totally As Told by Ginger, which I just thought was written well. There were a bunch of characters, the storylines were more pre-teen/teen-oriented, and the depiction of social life at school was a little more believable than a lot of other shows. Plus, there was a special where they went to camp, and I spent two of my summer during college working at a resident camp, so that held a special place in my heart. I know you're dying to share... what have your favorite cartoons been throughout life? ?